Israeli Occupation Forces (IOF) shot dead two Palestinian youths before an Israeli army bulldozer proceeded to climb over and smash the vehicle they were in, during clashes which broke out near Joseph’s Tomb site in Nablus city, northern West Bank, on Wednesday morning. 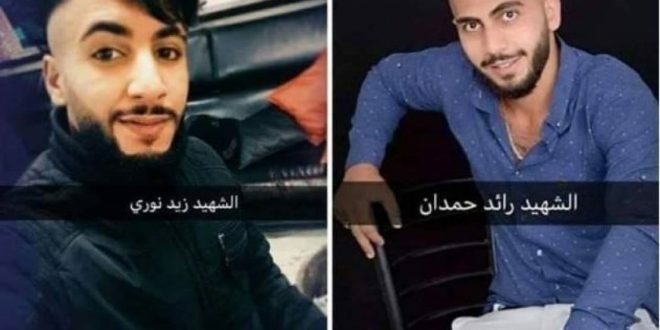 The two were identified as Raed Hamdan, 21, and Zaid Nuri, 20, and were left without treatment as paramedics were blocked from approaching therm by IOF. The Palestinian Red Crescent crews said that they came under fire while trying to reach the wounded, and the Israeli army prevented them from reaching the wounded. The sources confirmed that the IOF executed the martyrs in cold blood and walked over the vehicle while the two youth were inside it. Palestinians announced general strike in Nablus following the shooting. It is noteworthy that last night, IOF killed another Palestinian, Omar Abu Laila (19) who was accused of carrying out a stabbing and a shooting at a checkpoint near Salfit city, northern West Bank.